Ten years ago this week, Phnom Penh City Hall and the development firm Shukaku Inc announced an agreement to transform the Boeung Kak lake area into a sprawling mixed-use development. In the years following, thousands were evicted and a protest movement grew among the disgruntled residents. Post Weekend looks back at how Cambodia’s most notorious land dispute unfolded and at what will emerge from the sand. The sand banks have been slowly rising around Kith Chantha’s rickety wooden shack. His home is no more than a few planks of wood held together by nails, with a front yard strewn with garbage. To one side, Chantha has the towering Al-Serkal Mosque as a neighbour. But apart from that he is surrounded by mounds of sand and construction equipment on what used to be the sprawling 90-hectare Boeung Kak lake. Chantha is one of close to 30 families at Boeung Kak lake who are continuing to battle Phnom Penh City Hall, seeking compensation or plots of land in order to make way for planned development activities. This Monday, February 6, marks a decade since the city publicly acknowledged that it had leased 133 hectares, including the lake’s 90 hectares, to a little-known development firm called Shukaku Inc, which is associated with powerful ruling party Senator Lao Meng Khin. Since then, the lake has been filled, close to 4,000 families have been forcibly evicted or resettled, and only recently has Shukaku started developing the land into what it calls “Phnom Penh City Center The Pearl of Cambodia”. Chantha has had to thwart company security guards multiple times from tearing down his house. But he feels it is only a matter of time. “Two weeks ago, a big crane came here to put poles in the ground. They were right behind my home,” he says. This recent construction activity has also hindered Chantha’s movements. His house is now surrounded by metal and concrete fencing, leaving him with two options – traverse concrete walls to reach the street or slip through a small section of barbed wire. Over the past decade, the Boeung Kak lake development has become the poster child for the Kingdom’s contentious land rights disputes. The Phnom Penh governor in 2007, Kep Chuktema, signed the 99-year lease at a throwaway price of $79 million, without any prior public consultation. And since then, the project has followed the now-familiar trajectory of many of the country’s land disputes. Estimates pegged the population around or near the lake at about 4,250 families, or 20,000 residents. While most of them settled there after returning from Thai refugee camps in 1993, only a few remember the lake from before then. Ly Chanry, 45, is one of the early settlers at Boeung Kak. “Back then, Boeung Kak was like a monument for us,” she says. Chanry says she built a small cottage in 1984 at Village 1 in the lake’s northwest corner. A small dirt road was the only thing separating her from the water. This was a good location because it faced east, she explains. The lake was a resplendent blue surrounded by green shrubbery and a popular location for Phnom Penh’s residents to kick back and relax. But after the end of the civil war in 1993, the population around the lake began to grow. As thousands poured into the capital, many decided to settle around the lake, slowly changing life around it. “As more people started living on the lakeside, they would throw out their garbage or waste into the water,” Chanry says. In 2004, the city organised a competition involving international urban experts and architects, with each team having a Cambodian representative. A project called the “Pearl Plan”, in which retaining the lake’s beauty was pivotal, won the competition and was picked by the city for implementation. The plan was expected to fill in only 10 percent of the lake and develop commercial and residential areas in the area surrounding it. The competition summary called the plan a “dense urban green lung in an Asian metropolis that will reclaim for Phnom Penh the title of ‘The Pearl of Asia’”. This is where things became murky, however. In April 2006, Chuktema made a surprise switch when he told local media that the city had instead decided to fill in 90 percent of the lake and develop the reclaimed land. Ten months later, City Hall announced the Shukaku deal with little clarity on how the deal came about. “There was no transparency,” says land rights official Sia Phearum. “They never asked the people who were living there.” Despite repeated attempts, former governor Chuktema could not be reached for comment. Phearum, who heads the Housing Rights Task Force, says neither City Hall nor the government factored in the villagers while giving the project the green light. He adds that a proper public consultation and inclusion of villagers in the plan could have smoothed out the long-standing protests over the past decade. Following the project’s announcement, there was a lull for more than a year, with no activity taking place at the site. Only in August 2008 did the company begin pumping tonnes of sand into the lake. Days later, the Council of Ministers changed the lake’s status from “state-public” to “state-private” land. Immediately, homes, guesthouses and restaurants along the lake started flooding. An injunction filed to hold Shukaku responsible for the consequent collapse of houses was rejected by the Appeal Court. As people desperately tried to save their belongings, City Hall began offering compensation to villagers as a way to coerce them to leave. The city put two options on the table: a flat $8,500 to leave the area or $500 and a small apartment in Phnom Penh’s Dangkor district, on the southwestern edge of the city. In many cases, armed police and district security guards were used to intimidate villagers into accepting these options, and if met with resistance, they were forcibly evicted from the lakeside with little or nothing. While City Hall has never revealed how many people accepted compensation packages, estimates by local representatives suggest about 1,000 families willingly took the money and left. Sen Touch was not so lucky. The mother of three lived on a 970-square-metre plot of land, on which she had a home and 14 single rooms for rent. She says she was offered only two plots of land of 4-by-18 metres in size much smaller than what she had occupied originally. Touch is not sure of the exact date, but around the time of the 2010 Water Festival stampede, she found excavators standing outside her house. They had already begun pulling down the 14 rooms. She and her family made a human chain in front of their house, begging for a few days to empty it of its possessions before it was torn down. “We then dismantled the entire house, even the staircase, and started to transport it to Sen Sok district,” she says. Touch says she had a small piece of land, 7-by-15 metres, in Sen Sok district’s Khmuonh commune. The family then proceeded to rebuild their entire home there. Her current home is an almost identical replica of her residence at Boeung Kak. Touch was not the last to be evicted. As evictions continued unabated, City Hall stuck to the two compensation packages on offer. They continually rejected villagers’ demands that they be given an onsite resettlement option. This changed, however, after a World Bank Inspection Panel issued a stinging critique of the body’s $28 million Cambodia Land Management and Administration Project, a land-titling program that included the Boeung Kak area. The report found that the project had arbitrarily excluded certain land from the titling process, which impacted residents in the Boeung Kak area. Not long after the report was released, the World Bank in August 2011 announced an immediate freeze on new lending in the Kingdom until the dispute was settled by the government. A few days later, Prime Minister Hun Sen issued a sub-decree carving out 12.44 hectares from the original lease for an onsite resettlement zone for the nearly 700 families left tussling with local authorities. While a small victory for the Boeung Kak activists, their struggle was far from over. Over the past four years, protests from these same families against City Hall’s sluggish demarcation and allocation of onsite land have been frequent. A group of prominent activists led by Yorm Bopha, Tep Vanny, Nget Khun, Kong Chantha and Bov Sophea – has become the face of these protests and at the same time has endured multiple beatings at the hands of police and district security guards. Most recently, Tep Vanny was arrested for taking part in a cursing ceremony. The courts then decided to revive two long-dormant cases against the activist, convicting her in one of them. She remains in pre-trial detention for the other. This relentless drive to hit the streets, even to protest on behalf of other causes, has seen them labelled as professional protestors by local authorities. But Nget Khun brushes off such labels. The 78-year-old Khun, who is affectionately called “mummy”, does not need to protest anymore. In 2015, she was allotted land and a title for it. But Khun refuses to accept it, saying she has to keep fighting until everyone gets justice. “They’ve tried to colour us as a group of opposition party supporters. [They] even said we were professional protesters hired for $10 a day. But our protests do not serve anyone else,” she says. With the protests as a backdrop, questions have lingered about Shukaku’s plans for the site since they were granted their lease. During the early days of the project, neither Shukaku nor City Hall released any plans publicly. Even the origins of the company are unclear. The Ministry of Commerce business registry shows the firm to have been incorporated only in 2015, with Meng Khin’s wife Sopheap Choeung listed as its chairman. In 2011, Shukaku partnered with Chinese firm Erdos Hong Jun Investment to form the property development firm Shukaku Erdos and began showcasing plans for its satellite city and business centre. 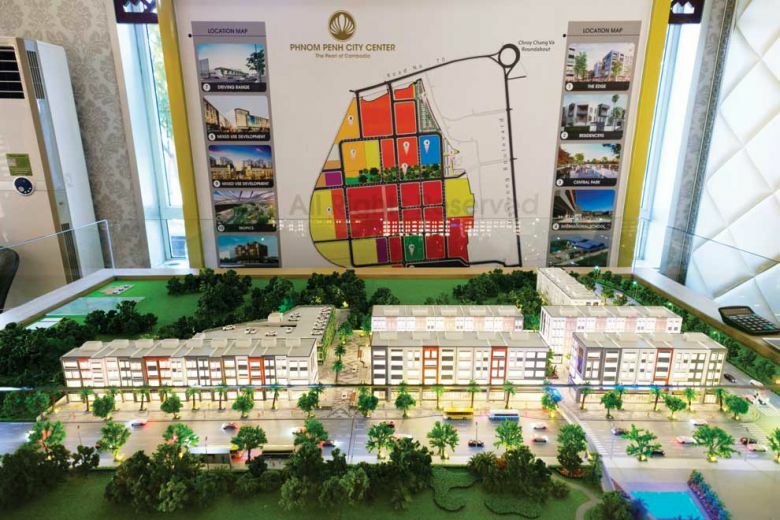 But the two firms parted ways in 2014, and since then, Shukaku has released a new plan for the “Phnom Penh City Center”, where it is selling plots piecemeal to other developers to construct the project’s various components. It includes a park, a sports complex, a golf driving range, an international school, mall, a residential villa development and a massive mixed development project called One Park. Michelle Lau, managing director of Shukaku and daughter of Lao Meng Khin, wrote via email that the project was being developed in a phased manner over the next 15 to 20 years. “Implementation of the plan will take more time yet, but we are dedicated and confident to make it happen,” she wrote. Speaking of the 4,000 odd families that were displaced to make way for the project, Lau only said that City Hall was working “very hard” to find compensation solutions so that “everyone is happy”. “For a small number of families this is still ongoing, [but] we are confident that a solution can be found soon,” she wrote. Lau did not address questions relating to how Shukaku was awarded the project in 2007 or their role in the displacement of Boeung Kak residents. But City Hall spokesman Met Measpheakdey defended the city’s role in the compensation, saying everyone was offered fair compensation solutions, but it was villagers who wanted more that were left unhappy. He reiterated that people had no right to live near the lake because it was state-private land but did not address the fact that this transfer was made only after the project was awarded to Shukaku. It has been a long decade for Chan Puthisak. The 42-year-old representative of families from Village 1, Puthisak has been one of the most prominent, and rare, male land activists of the Boeung Kak cause. But things changed for him four months ago. He and 16 other families were finally allotted small plots of land within the resettlement area. Sitting on a pile of rocks that will soon be used to build a home, Puthisak says moving to his new home has not changed his zeal for the protests. After being on the front lines of many of the protests, and being beaten and arrested numerous times, Puthisak now calls himself a “community journalist”. He documents all the protests on social media and liaises with the press to pass on information. Despite getting land for himself, he says most activists vowed to not back down until each villager was justly compensated a promise he takes seriously. This entry was posted in Boeung Kak, Development, Forced Eviction, Forced Evictions, housing, Human Right, Land Depute, Land Title, Phnom Penh, Phnom Penh Post, Violence and tagged ការឃុំខ្លួន, ការតវ៉ាដីធ្លា បឹងកក់, រំលោភសិទ្ឋិមនុស្ស, Boeung Kak, Boeung Kak Lake, Cambodia, Construction, Development, Evictions, Forced Evictions, human rights, Land Depute, Land Dispute, Phnom penh, Phnom Penh Post, Protest, Violence. Bookmark the permalink.